If you are familiar with Hyderabad, Karachi Bakery is sure to ring a bell. To those who don’t know, here is some info about it. Karachi bakery is established by Khanchand Ramnani in 1952 near Mozamjahi market in Hyderabad. 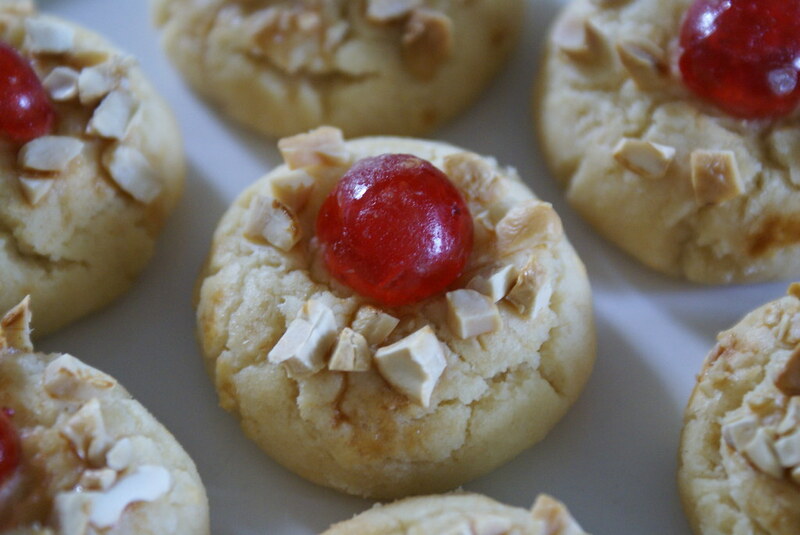 It is known the world over for its excellent biscuits, which include Fruit biscuits, Cashew biscuits etc. They are often carried outstation as souvenirs from Shahi Hyderabad. The aroma of bread and biscuits, which emanates from the bakery, compels one to peep into the bakery once. Mozamzahi Market also hosts the time tested hyderabadi favourite IceCreams – Famous ice cream parlour which is the 65 year-old ice cream parlour and has seasonal specials like mango ice creams and muskmelon ice creams. Anyone visiting Hyderabad must not miss these, and not to mention the Hyderabadi Biryani! 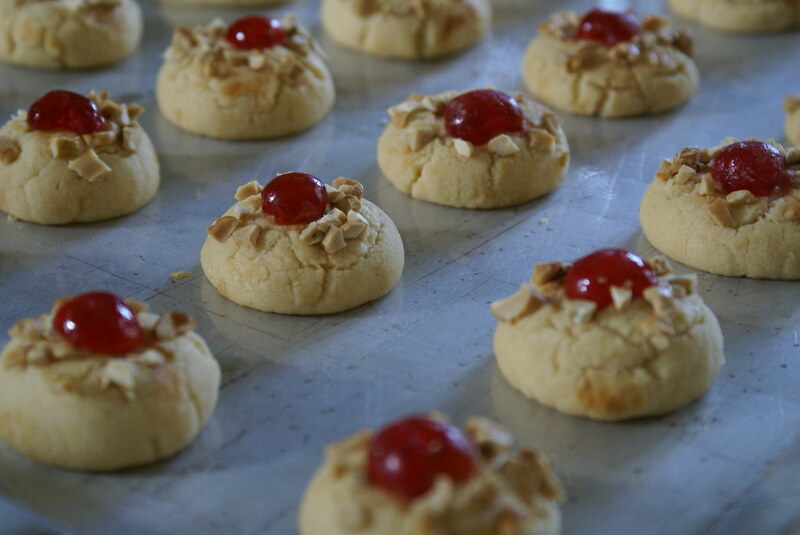 Cookies just out of Oven! Add Sugar, little by little, and beat till fluffy. Add egg yolk, essence and lemon rind to the butter mixture and beat on medium speed till well mixed. Form small balls, and dip half in slightly beaten egg white. Roll in chopped nuts. Press half cherry into center of each ball. Put on a greased tray. Bake at 180C for 25 mins. 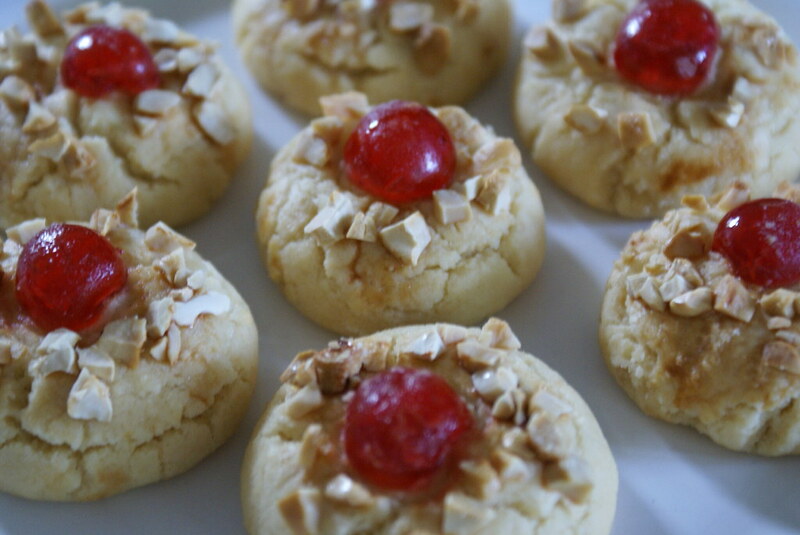 Not very sweet but the cherry compensates the sweetness of the cookies. yummy, they look like they would melt in your mouth. first time at your blog, I like it! Perfect, delicious, decorative little creations. wow a super blog i saw today….its amazing..the pics and all the dishes r absolutely fantastic….. They sure look similar to the kaju biscuits. I am surely going to try them. I absolutely love the Karachi bakery biscuits ! A visual treat to my eyes…your way of presenting the recipes is very appealing…Great going..
ThankYou all for the wonderful comments! Saju, Iam glad that u like my blog! Viji, Thanks for dropping by! hey, thanks for visiting my blog and letting me know of you beautiful blog with a lovely name. and you are from hyderabad!! me too. you have so many lovely recipes that didnt know where to comment. I loved the pics of all and the cookies are very cute and impressive. Sharmi, you have wonderful blog too…and Iam glad know that u r from Hyd too!! Thanks for stopping by! They sure look like store bought biscuits. Very pretty! Would love to go to Mozamjahi and eat Sitaphal icecream in season!! These cookies are picture perfect! The cherry-on-top is a beautiful touch. Your cherry knobs look so pretty! Can this recipe be converted into cups ?